‘The idea of bittersweet is changing the way I live, unraveling and re-weaving the way I understand life. Bittersweet is the idea that in all things there is both something broken and something beautiful, that there is a moment of lightness on even the darkest of nights, a shadow of hope in every heartbreak, and that rejoicing is no less rich even when it contains a splinter of sadness. ‘It’s the practice of believing that we really do need both the bitter and the sweet, and that a life of nothing but sweetness rots both your teeth and your soul. Bitter is what makes us strong, what forces us to push through, what helps us earn the lines on our faces and the calluses on our hands. Sweet is nice enough, but bittersweet is beautiful, nuanced, full of depth and complexity. Bittersweet is courageous, gutsy, audacious, earthy. ‘This is what I’ve come to believe about change: it’s good, in the way that childbirth is good, and heartbreak is good, and failure is good. By that I mean that it’s incredibly painful, exponentially more so if you fight it, and also that it has the potential to open you up, to open life up, to deliver you right into the palm of God’s hand, which is where you wanted to be all long, except that you were too busy pushing and pulling your life into exactly what you thought it should be. ‘I’ve learned the hard way that change is one of God’s greatest gifts, and most useful tools. Change can push us, pull us, rebuke and remake us. It can show us who we’ve become, in the worst ways, and also in the best ways. I’ve learned that it’s not something to run away from, as though we could, and that in many cases, change is a function of God’s graciousness, not life’s cruelty. Niequist, a keen observer of life with a lyrical voice, writes with the characteristic warmth and honesty of a dear friend: always engaging, sometimes challenging, but always with a kind heart. You will find Bittersweet savory reading, indeed. If it were any other time, any other season, I probably wouldn’t have picked this up from the Kindle store. I wouldn’t have looked at this twice, because I don’t think it’s for me, or I would be interested. When was the last time I read a non-fiction, self-help book like this? I can’t remember. But I know for sure that if it were any other time early this year, or if it were any other season in my life, I wouldn’t have decided to get Bittersweet by Shauna Niequist and read it immediately after it loaded on Hannah the Kindle. Oh, I guess it helped that the ebook was on sale when I saw it, so I bought it. But still, I wouldn’t have gotten it and enjoyed it as much as I did if it were any other time of my life. 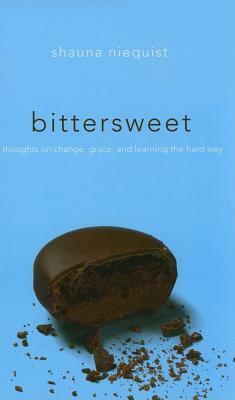 Bittersweet: Thoughts on Change, Grace and Learning the Hard Way by Shauna Niequist is about so many things, but mostly, about how life is bittersweet. How life isn’t always happy or sweet but we shouldn’t let the bitterness of it get to us. There is such a thing as bittersweet, and it’s the kind of life that we should appreciate, especially because all the learning and the changes and (most importantly) grace is seen in the bittersweet parts of life. This is a collection of essays and realizations about her life, and what she learned from them — from her fights with her husband to moving to a new place, from meeting new friends, having parties and serving them food and these friends moving away. From her problems getting pregnant again to broken hearts, family members dying and babies being born. The book is an honest collection of stories that the reader will definitely relate to at some point, and drives the point that life is really bittersweet. Like I said, if I read this at any other time, I don’t think it would have made as much of a big impact as it did now. Bittersweet kept me company during the hard days, and spoke to me over and over and over again about grace and God’s faithfulness. I couldn’t relate to some of the stories Niequist wrote because I don’t have a family, and I haven’t moved away yet, but the lessons she talked about were universal, and somehow I felt like she really knew what heartache is, and she can relate to me. Her words served like a balm to my soul, and some passages made me cry several times because it felt like they were exactly what I needed to read. In a way, it seemed like a promise, too — that whatever you’re going through, whatever your situation is, God knows it, and He will take you through it. It’s not easy, but you have a choice to view your situation as bittersweet. And from her words, it seemed like she’s healed and moved on from the hard parts of her life and if she can do it, then you definitely can, too. I needed that, and as I read the book more, I realize that maybe it was meant for me to see this book on Amazon, and to see it on sale so I can buy it. Granted, some of the stories were a little repetitive, like stories at the end had some similarities to the stories at the start, but by the time I got to that, I was far too in love with what I’ve read for me to really nitpick about it. Despite that repetitiveness, though, the stories in Bittersweet were honest and heartfelt and real, and it made me feel that I had a friend in Shauna Niequist, even if this is the first book of hers I’ve read.